Huangshan City Guide. China Travel Services. CTS. Los Angeles. San Francisco. Huangshan (Yellow Mountain) is located in the southern part of Anhui Province in eastern China. Famous since ancient times for its incredible landscape of craggy rocks and gnarled pines, Huangshan is made up of 72 peaks, with evocative names such as Lotus Flower Peak, Brightness Apex Peak, Celestial Capital Peak, etc. 30 of these ascend to heights of over 4900 feet, with the highest being approx. 6000 feet. In the Qin Dynasty (221-207 B.C. ), Huangshan was called Yishan. During the Tang Dynasty (618-907), Emperor Minqhuanq believed the story of the Yellow Emperor making immortality pills here during ancient times and changed the mountain's name to its present one. Huangshan has also been known as Three Heavenly Capitals because people believed its three main peaks, Tiandu, Lianhua and Guangmingding, are home to the Heavenly God. Since Huangshan gains elevation relatively quickly, the plants grow in a vertical direction on the steep mountainside. There are generally mason pine trees below 3000 ft., but higher up is another kind of pine, designated by botanists as the "Huangshan Pine". 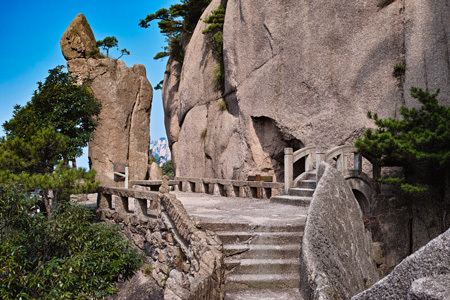 Huangshan abounds with peculiar pine trees, and most of them grow in steep precipices. The pines are unusual for their odd shapes, either being tall and straight, or twisted and bent with many peculiar ones having been given descriptive names. Rock and Pine always pair together on Huangshan, as the saying goes: "There is no rock without a pine growing on it, and there is no pine that is not growing in a strange shape." Jagged peaks and strange rocks are everywhere on Huangshan. Some peaks resemble stalagmites and some rocks look like peaks. Sometimes peaks and rocks combine to form various images, including potted landscapes, flying birds or human figurines, such as those named “Five Old Men Going to the Heavenly Capital” on Tiandu Peak, “Monkey Watching the Sea at Qingliang Terrace” and “Two Immortals Playing Chess on Shixing Peak”. The most interesting is the rock called “Flowers Painted with a Dreamed Writing Brush”, which vividly resembles a writing brush and a pen-holder with flower-like pine trees protruding at its tip. Huangshan's “Seas of Clouds” are also unique. The high mountains, deep valleys, abundant rainfall, low temperatures and high pressure cause very changeable weather patterns. Clouds often gather unexpectedly to form cloud-seas. There are five major places to watch the "Huangshan Seas": the Yuping (Jade Screen) Pavilion for watching the South Sea, Qingliang (Clear and Cool) Terrace for the North Sea, Paiyun (Cloud Dispelling) Pavilion for the West Sea, Bai'e (White-Goose) Ridge for the East Sea, and Pingtiangang for the Heavenly Sea. Additionally, the hazy mists drift among the high peaks, adding a mythical quality to the mountain. There is also a scenic area featuring hot springs on Mount Huangshan. The hot spring water is approx. 106 F year round. The springs were called Cinnabar Springs in ancient times because Zhusha (Cinnabar) Peak is its source and the phenomenon of vermilion cinnabar (mercuric sulphide) gushing up from the springs occurs every 300 years. Northeast of the hot springs, there is Huangshan's largest waterfall - the Jiulong (Nine-Dragon) Waterfall - roaring down spectacularly. This spot also marks the starting point of the cable car up to the mountaintop. In 1990 Huangshan Mountain was designated a World Heritage Site by UNESCO. The following description may help readers gain a better understanding of the formal inscription of Huangshan as a World Heritage Site. Huangshan, known as "the loveliest mountain of China", was acclaimed through art and literature during a good part of Chinese history (the Shanshui "mountain and water" style of the mid-16th century). Today, it holds the same fascination for visitors, poets, painters and photographers who journey in pilgrimage to this enchanting site, renowned for its magnificent scenery made up of many granite peaks and rocks rising out of a sea of clouds. This area was formerly called Huizhou, and has been famous since ancient times for scholarship in literature, as well as arts such as painting, engraving, architecture, carving, opera, handicrafts, etc. Literary learning has long been prized in Huizhou; a common purpose for friends to meet was to discuss each other's writings. There was a saying that “Even a small village of ten households hears continuous reading voices day and night”. This quest for knowledge has been passed down through the generations. Local people take pride in writing their own Spring Festival couplets, and it is no wonder that so many famous scholars have emerged from Huizhou. Huizhou is also known for producing many wealthy merchants during the Ming and Qing dynasties, who returned to build houses in their home towns. Many of these towns have been preserved, and their street plans, architecture and decoration are representative of settlements from long ago. In the year 2000 the ancient villages of Xidi and Hongcun in Yi County were awarded UNESCO World Heritage status. The classical Chinese architecture of these and other neighboring villages may be visited as a day trip from Tunxi. The four seasons are all special on Huangshan Mountain, but the scene in winter is even more magical. Winter in Huangshan is a world of silver dreams. Numerous ravines and peaks in Huangshan Mountain are covered with snow and ice drifts. The pine trees, grass and rocks are enveloped in the mist and drizzle, forming icicles that transform the landscape into a Crystal Palace. Visitors become so intoxicated in this picturesque landscape that they are reluctant to return home. Beihai Scenic Area is in the central part of Huangshan Mountain. The viewpoint extends out among the cliffs and is an ideal place to view the spectacular sunrise and sunsets. There are the Pai Yun (Cloud Dispersing) Pavilion, the elegant and refined Shi Xin (Seeing is Believing) Peak, Shisun Peak (Bamboo Shoot Peak), and Qingliangtai (Refreshing Platform). Shixin Peak, in eastern Huangshan Mountain, attracts the greatest number of tourists. People say that the beauty of Huangshan is unbelievable until you reach this peak. That is why it is named Seeing is Believing Peak. The deep chasm below Shixin Peak is home to the Huangshan Monkey. Yuping Pavilion, 5500 feet above sea level, is known as the Jade Screen of Heaven. It offers an excellent view of the entire mountain. A unique experience here is to watch white clouds drift below after rain, when picturesque mountain peaks, fantastic rock formations and green pines are enveloped. In the western part of Huangshan Mountain, there is a huge rock on Feilai Peak. The rock is 33 feet high, standing alone on top of the peak. The base of the rock is separated from the peak so it looks as if it had fallen from the sky. As the rock is shaped like a pear, it is also named Pear Rock. Situated between the Purple Cloud Peak and the Cinnabar Peak, this waterfall separates and drops down in two distinct streams with a thunderous sound and a spectacular view. Wenshu Tower is located in the central part of Mount Huang and is also named the Jade Screen Tower. The nearby scenic spots are Lotus Flower Peak and Celestial Capital Peak. The original temple is now the site of the Jade Screen Hotel. With the Greeting Pine rising above and behind the hotel on the left, the Send-off Pine and Lixue Rostrum on the right, and Wenshu Rostrum and Genyun Peak in front, it is a very picturesque spot. The temple that originally rested on this site was named Fahai Temple and renamed Ciguang Temple in the Ming Dynasty. It is now the location of the Ciguangge Hotel, above which is the Hansha Mountain Ridge and the Miaozhi Pavilion. Behind the ridge is the Horse-Standing Pavilion, where one can see the 10 Chinese characters "Li Ma Kong Dong Hai, Deng Gao Wang Tai Ping" (Look ahead to Dong Hai and Tai Ping at the top of the Horse-Standing Peak) carved on the precipice. The most perilous section of the trail leading to the Celestial Capital Peak, the Crucian Back is 100 feet in length but only 3-4 feet in width, with a deep valley below. Stone railings and iron chains have been installed on the western side in order to prevent accidents. Tangchi Pool is a pure hot spring at the southern foot of Mount Huang situated 1-1/2 miles north of Tangkou. The spring produces 48 tons of water per hour, with a temperature of 104 F. Its nearby scenic spots are the Fish-Watching Pavilion, Yirang Pavilion, Jade-Making Pavilion, Renzi Waterfall, etc. Lianhua Peak, the highest peak of Huangshan Mountain, is 6100 feet above sea level. It is shaped like a lotus flower in blossom surrounded by steep slopes and rocky peaks. On top of the peak is a boat shaped rock named Boat for Picking Lotus Seeds. Hikers gathering here to look around appear as if they are reaching the sky. This ridge is located at the eastern end of 1000-meter-long Pingtiangang. It is a look out area where people can observe the Sea of Clouds, and is an ideal place to view the sunrise. The Huangshan Meteorological Station is also situated here. The Lion Peak is the name given to this area which includes several peaks. The lion's head is Danxia Peak above Dianxian Deep Pool, the lion's waist is the Qingliang Rostrum and the lion's tail is the Dawn Pavilion. At the mouth of the lion's head is a colorful temple. The so-called Lion Building is situated to the south of Lion Peak with pines and cypresses reaching toward the sky, and with thick grass and plants covering the ground. Among the precipitous cliffs is the Qingliang Rostrum, which is the best place for viewing the Sea of Clouds of the back mountain. On the left and right of Lion Peak are stalagmites. To the north of Lion Peak is the wonderful scenery of "The Lion looking to Taiping County", and "Magic Brush in Flower". This cluster of beautiful small peaks surrounds Pipeng, which is situated between the western part of the Lion Forest and the Cloudy Valley. Legend has it that a monk lived here for 30 years in a hut made of bark. The sprawling Cloud Valley Temple is approached by climbing the eastern side of Mount Huang and then passing Kuzhuxi. The temple, hidden between Boyu Peak and Luohan Peak, is surrounded by ridges and peaks, pines and bamboo. On the southern roadside are stone carvings from various generations. This is the most magnificent waterfall of Mount Huang, cascading down between Xianglu Peak and Luohan Peak in 9 steps. Baizhang Spring, between the Hot Spring and the Cloud Valley Temple, includes a waterfall with about a 1000 foot drop. During the dry season the waterfall becomes just a trickle, and has a beautiful appearance reminiscent of “drifting yarn”. The Pine Valley Nunnery lies below Diezhang Peak. There are five pools in front of the Nunnery, giving it a beautiful appearance: Black Dragon Pool, Yellow Dragon Pool, Old Dragon Pool, White Dragon Pool and Green Dragon Pool. As one of the eight most famous cuisines in China, Hui cuisine has a history of more than 1000 years. It originated from She County but gained popularity through the travels of Hui merchants to major cities in China during the Ming and Qing Dynasties. The highly distinctive characteristic of Hui cuisine lies not only in the extensive choice of cooking materials but also in the strict procedures of the cooking process. Most ingredients in Hui cuisine originate in mountain areas. The ingredients are cooked over a hot fire, and Hui chefs pay close attention to the presentation of the dish, to ensure it is appealing to the eye, as well as to the palate. Mainly covered by mountains and hills, rich geothermal energy resources, within the scope of slate and loess and with evergreen broadleaf forest. Xin'anjiang River, Taiping Lake, Shuxi River and Huishui River. In addition to Mt. Huangshan, there are the neighboring Mt. Jiuhuashan and Mt. Qiyunshan. Rice, wheat, tea, flue-cured tobacco, hemp, famous premium tea - Huangshan Maofeng and Taiping Houkui, Huangshan Magic Fungus-glossy Ganoderma, Huangshan Xianggu Mushroom, Huangshan Air-dried Bamboo Shoots. Huangshan is served by the Tunxi airport, with regular flights to Shanghai and Guangzhou, plus less regular flights to Beijing, Hong Kong, Shenzhen, amongst others. There are major highways connecting Mt. Huangshan with other large cities. The bus station is near the Hot Springs Hotel and there are approximately twenty journeys each day with additional buses operate during peak travel seasons. Huangshan is connected via rail to several cities in China, including Beijing, Shanghai, Nanjing, Fuzhou and others. The transport system within the scenic area consists of roads, hiking trails and cable cars. Currently, there are four main roads within the scenic area: from the Hot Spring to Tangkou, from the Hot Spring to Cloud Valley Temple, from the Hot Spring to Benevolent Light Temple, and from Furongling to Pine Valley Nunnery. There are more than 30 hiking trails on the mountain; some are stone-paved paths, others are paved with granite slabs, and some are carved out of the mountainside. The steps are relatively level with coarse surfaces and are also equipped with handrails in some areas to ensure walkers' safety. Along the paths, there are also many sightseeing places, bridges and viewing platforms, which offer the opportunity to rest while enjoying the scenery, as well as shelter from the elements. Travels between Cloud Valley Temple and White Goose Mountain. The journey lasts 8 minutes. From here you can visit the Begin to Believe Peak, the Monkey Gazing the Sea, the Refreshing Terrace as well as the West Sea Scenic Area, the Cloud Dispersing Pavilion, the Red Cloud Peak, etc. Travels between Pine Valley Nunnery and Pine Forest Peak. The journey lasts 12 minutes. Travels between the Benevolent Light Pavilion and Jade Screen Tower. The journey lasts 8 minutes.